Hand picked coins that grade at least fine to very fine with good strikes and clear dates. Issued by the Dutch East India Company (Dutch; Vereenigdde Oost-Insiche Compangnie or "V.O.C. "), the world's first multi-national corporation. The V.O.C. was charted in Amerstand in 1602 to conduct trade in Asia. 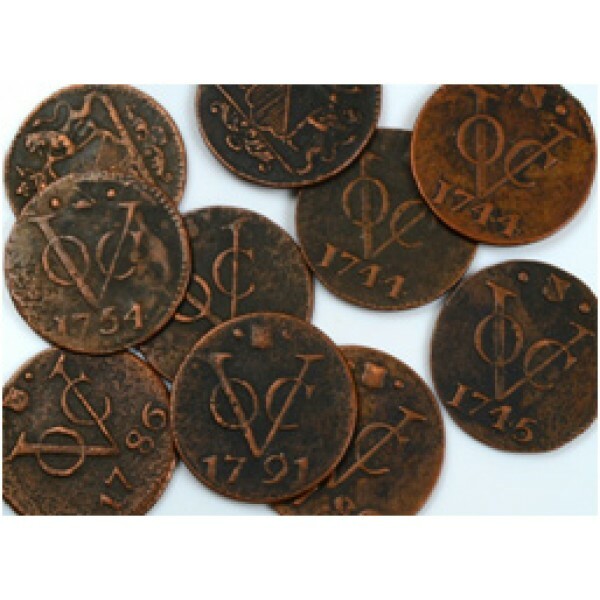 At it's peak it employeed 50,000 people, had an army of 10,000, a fleet of 150 merchant ships, and minted their own coins. The company paid an anuual dividend of 18% for nearly 200 years. The company was weighted down by corruption in the late 18th century ,went bankrupt, and was dissolved in 1800.